The fountain solution is cleansed through a set of four filters and pumped back to the offset press’ fountain tank free of contaminating particulates. InkZone Fountain, Digital Information’s all new fountain solution purification system, utilizes powerful, advanced nanofiber technology featuring ceramic nanofibers on a micro-glass matrix, originally engineered for medical applications, to filter out particulates down to two nanometers. With zero discharge and zero waste of incoming water, InkZone Fountain promises highly improved production conditions and a virtually unlimited fountain solution life cycle. InkZone Fountain is an affordable, environmentally friendly solution with a fast return on investment. Fountain solutions contaminated by ink and paper residue are the enemy of every printing pressman. Calcium, paper dust, fillers, coatings, and other residue from paper that continues to decrease in quality are particularly harmful to the process. Until recently, process stability could only be maintained by replacing fountain solution and cleaning out the „gunk“ build-up in the fountain tank on a weekly basis. Not anymore. This inefficient and time-consuming process is a thing of the past with Digital Information’s all new fountain solution purification system, InkZone Fountain. Against the backdrop of increasing customer demands, elevated pressures on cost, and an industry focused on environmental stewardship, print facilities can no longer afford the expense of press downtime or unnecessary waste in terms of economic or environmental resources. With InkZone Fountain, „going green“ has never been easier or more affordable. Digital Information’s InkZone Fountain is a simple, cost-effective, and highly efficient solution. InkZone Fountain’s unique four-step filter system uses nanostructured fibers to protect fountain solution from the pollution of microbiological growth by separating out micro-particles coming from inks and papers. Measurable parameters relevant to the printing process such as pH, water hardness, or electrolytic conductivity remain stable over a long period of time – guaranteeing press productivity and production quality of the highest possible level. The offset printing environment becomes more stable and thus more economical as it is possible to considerably reduce the amount of fountain solution on the printing plates. The result – less plate wear and less plate scumming and tinting. 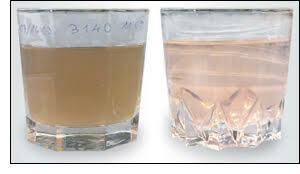 Fountain solution after a production run (glass left) and the effect of three hours’ purification with IZ Fountain (glass right). Cheers. The results of InkZone Fountain are astounding and immediate. Upon installation of InkZone Fountain in the pressroom, measurable results can be achieved on polluted fountain solution in just three hours. And, maintaining fountain solution cleanliness is easy. InkZone Fountain’s simple Smart-Gauge indicators clearly alert press operators when filters are due for replacement. 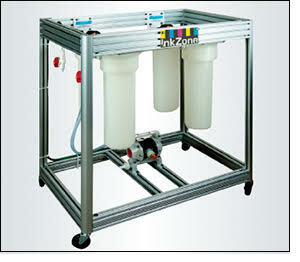 InkZone Fountain is easily installed on all machines and instantly ready for operation. InkZone Fountain can be added to any offset press from all established manufacturers regardless of the press size. InkZone Fountain filters are quickly and easily replaced to ensure long-term results. And, when compared against the standard systems delivered as part of the manufacturers’ original installation, InkZone Fountain is far superior in terms of cleaning efficiency, ease of maintenance, and cost effectiveness rendering the original filters obsolete when replaced with Digital Information’s high-performance InkZone Fountain. Visit Digital Information and InkZone Fountain at the China Print trade show, Hall E2, Stand 270, Beijing, PR China, May 14-18, 2013.